The votes are in! 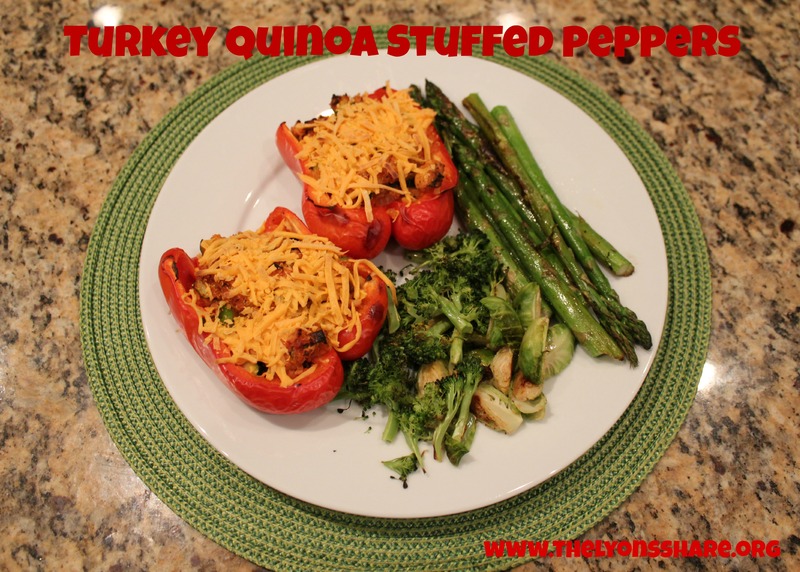 Those of you who commented all want to see the recipe for Turkey Quinoa Stuffed Peppers for today’s Foodie Friday … and your wish is my command! As a side note, those of you who text/ email/ Facebook me pictures of recipes you make from the blog COMPLETELY make my day, so thank you! Hope you continue to enjoy! This recipe has a great nutritional profile – with tons of antioxidants from the colorful veggies, a boost of protein from the turkey and the quinoa, and a balanced, stabilizing amount of carbohydrates. It is incredibly filling … I managed to eat a full serving (2 pepper halves) plus a hearty side of roasted vegetables, but I was pretty full (and satisfied) afterwards. The recipe is family-friendly … great flavors for the adults, and a fun “you-can-eat-the-bowl” meal for the kids (get them to “help out” by stuffing their own peppers). Most importantly, it’s delicious! 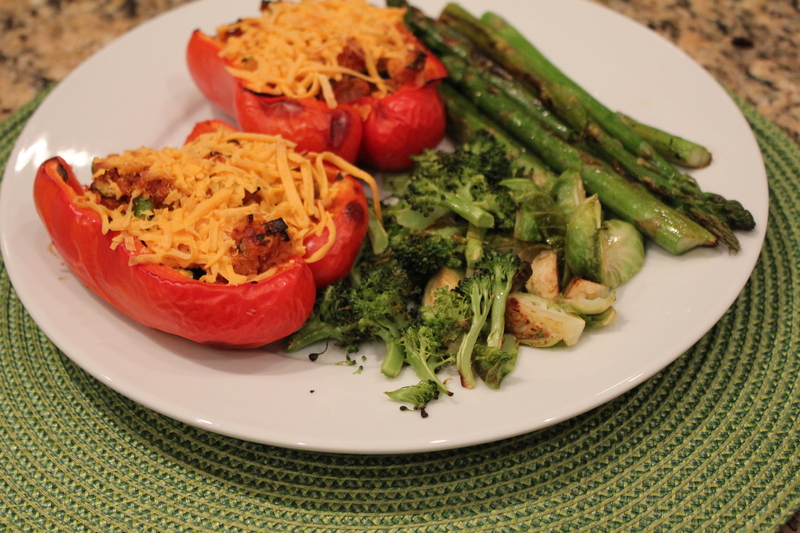 I loved the flavors that came through in this dish, and I hope you will, too! Wrap whole peppers in foil and bake for 15 minutes. Remove and set aside. This will start the softening process, since most of the other ingredients will be nearly fully cooked once you put the stuffed peppers back in the oven. Add olive oil to large skillet and heat. Add chopped onion and garlic, and saute for 2 minutes. 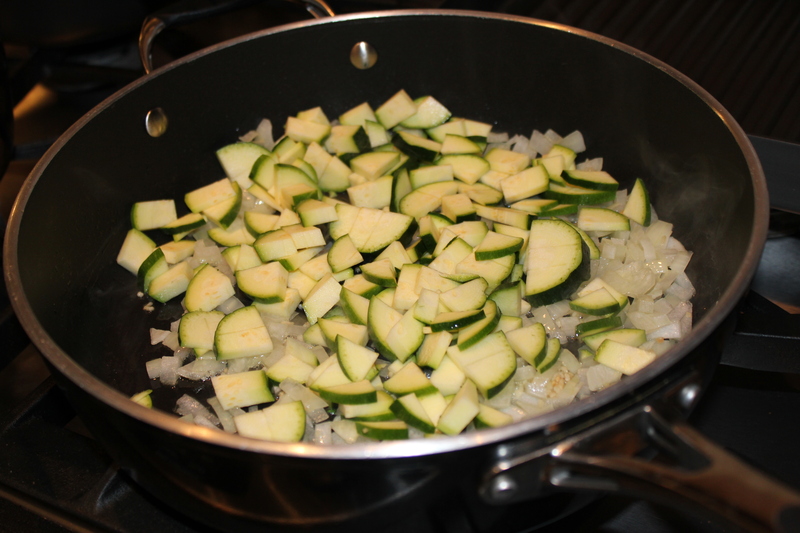 Add zucchini and saute for another 2 minutes. 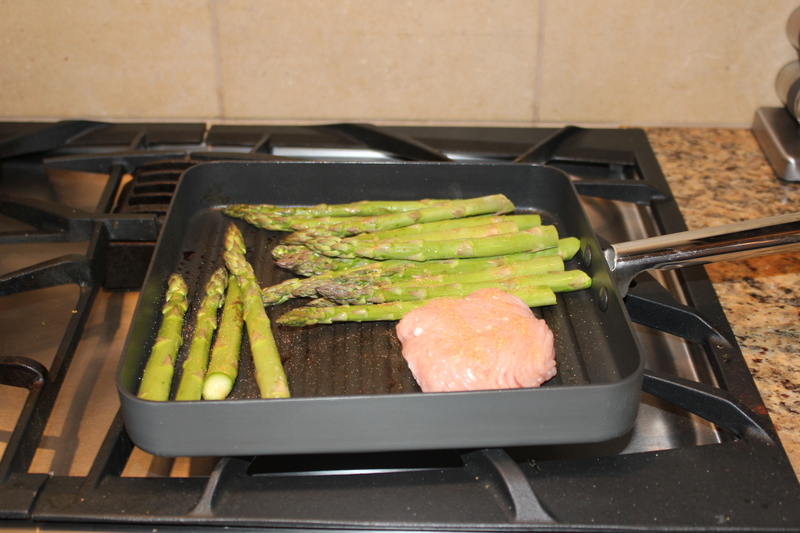 Add ground turkey (crumble/ chop it up with a spatula as you’re cooking) and saute until cooked through. 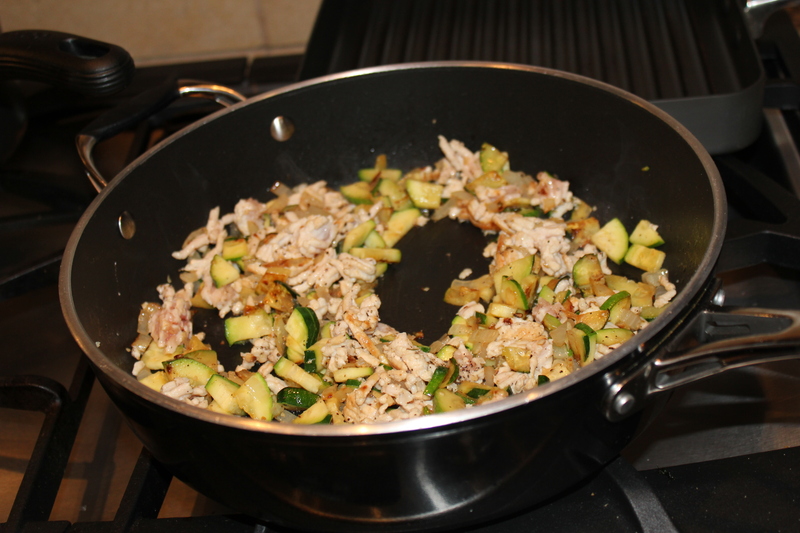 Add tomato sauce, spices, and basil to the skillet with vegetables and turkey. 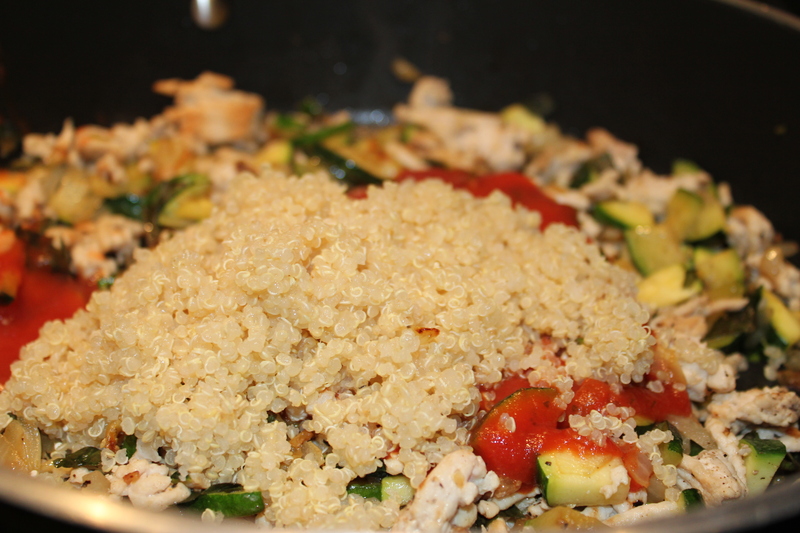 Stir in cooked quinoa. Remove top/ stem from peppers, and cut in half, lengthwise. Remove the seeds. Stuff each half with equal portion of turkey mixture. 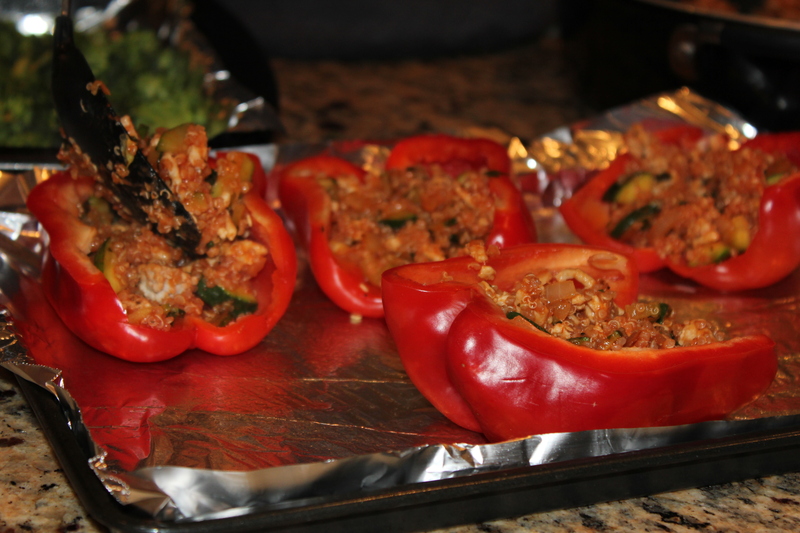 Cook stuffed pepper halves on baking sheet in oven for 15-20 minutes. If desired, add low-fat cheese and broil for 1-2 minutes. Serve with a side of green vegetables (we did “grilled” asparagus on an indoor grill pan since it was too hot outside, and roasted broccoli and Brussels sprouts. Enjoy! Cooked according to the recipe before adding cheese, 1 serving (2 stuffed pepper halves) contains 255 calories, 6.5g fat, 33g carbohydrates, and 17g protein. That comes out to 51% carbs, 26% protein, and 23% fat – pretty good stats! I bet this would also be good substituting in tofu or beans, if you’re vegetarian or don’t want to eat turkey. My mom, who thinks she doesn’t like peppers (but I think it’s a mental thing! ), suggested stuffing the filling in large Portobello caps, which also sounds great! 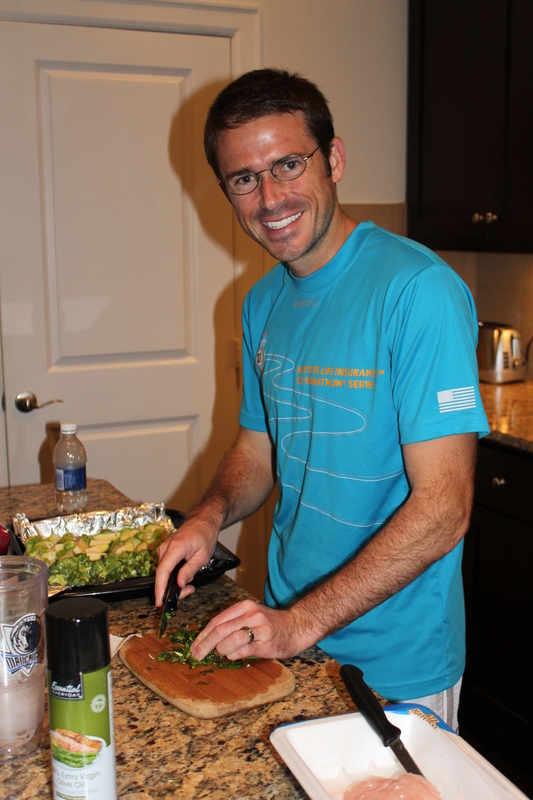 So tell me in the comments … What is your favorite “stuffed” meal to prepare? Do you have any foods that you think you don’t like (but actually like the flavor of when you don’t know they’re in the dish? What other recipes would you like to see coming up? Thanks, Kelly! Hope you like it! Is there an easy way to organize and/or store these great recipes you are sharing with us? I print and save, but think there’s probably a better system. The way I do it is create a folder on my computer called “recipes to try.” Within that folder, I have subfolders for “breakfast,” “baked goods,” “vegetarian entrees,” “salads,” “soups and stews,” “chicken dishes,” “meat dishes,” etc. I copy and paste the recipe from the blog into a Word document, and then save it in the folder. That way, it’s easy to find them later, and if I have a random ingredient that I want to cook with, I can do a search for that ingredient and the recipes including it will pop up. May not work for everyone, but it works for me! 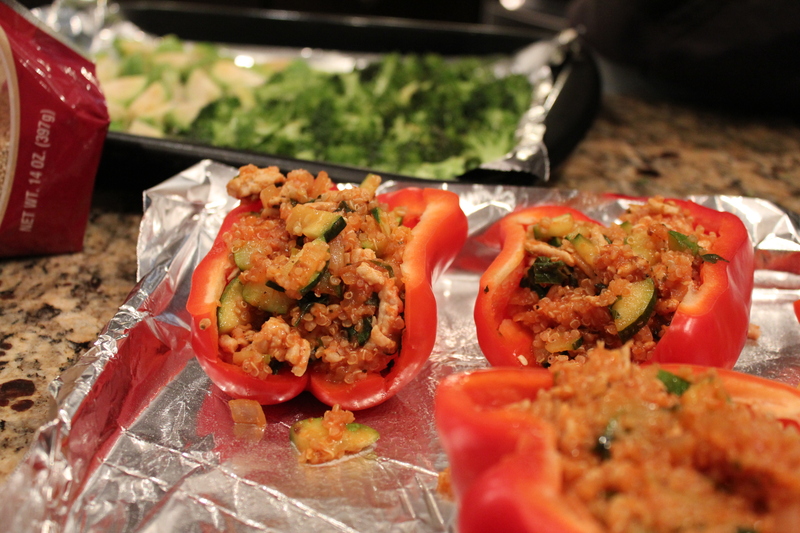 I made these tonight using green peppers and they were so good!! Thank you for sharing the recipe! 2. and incorporating more healthy food choices, so I inundated my house with healthy food choices (veggies, fruits and such) and have been trying new recipes (and old ones). This was a fabulous new one. Oh Tina, thank you so much for sharing! This honestly makes my day. I’m glad you liked the peppers! 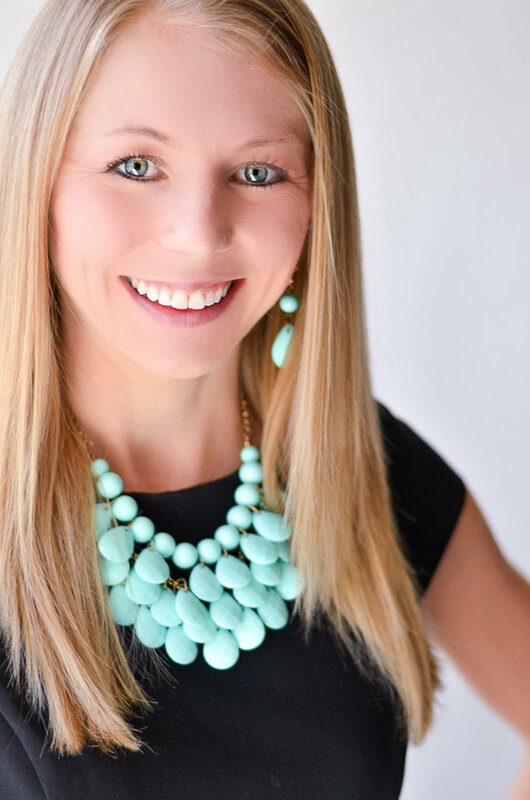 More importantly, congratulations on your life changes! I really like the mentality of adding healthy things IN (like you are doing with fruits and veggies!) rather than taking things AWAY. I think you’re on the right track! Thanks for reading.